Aren't you tired of hunting, digging, and scratching to find something in the Code Book? Stop spending all that time when you can find it in seconds using the ULTIMATE Code book. Ask the thousands of electricians, contractors, designers, inspectors, etc. that have one if it works. It took over 5 1/2 hours to personally hi-lite over 3,600 answers to exam questions that have been asked on previous electrical examinations. The "ULTIMATE" Looseleaf and Softback Code book also includes Tom Henry's BIG SELLER the "KEY WORD INDEX", REMINDER BOOK, 68 "CODE TABS" (installed for you) and the popular "FORMULA INSERT PAGES". Our biggest seller! If purchasing the Ultimate in Looseleaf form you will have the option of getting your name printed on the front cover of your code book for free. Article 425 Fixed Resistance and Electrode Industrial Process Heating Equipment, Article 691 Large-Scale Photovoltaic (PV) Electric Supply Stations, Article 706 Energy Storage Systems, Article 710 Stand-Alone Systems and Article 712 Direct Current Microgrids. 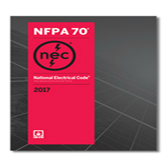 This book is titled Changes to the 2017 National Electrical Code® Workbook as it includes a 50 question exam as a summary of you reviewing the new NEC®.